In fact, the locals would bring in new customers and urge them to order the fries just to watch their reaction to Click's tirade. Everyone knew that his bark was worse than his bite, and that he was actually a good guy at heart. In 1982, Click sold the restaurant to the Bob Sanders family. They operated the restaurant until 1995, when the next owner, Roger Smith, purchased it. 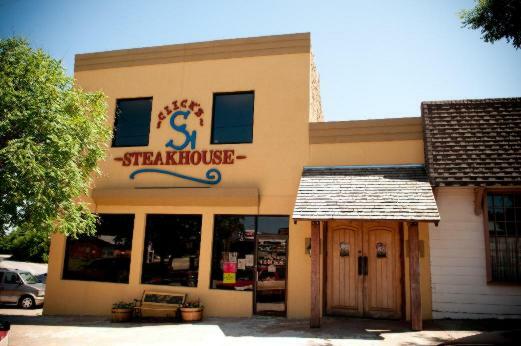 Though the building has undergone changes and the menu has expanded, the quality of the steaks and the unique aging and preparation technique has not. We hope you enjoy your dining experience with us, and we promise not to yell if you order fries! In 1962, Clifton "Click" Nelson opened a bar and grill in Pawnee, Oklahoma, originally named Click's Alamo Club. Customers knocked at the locked door and were checked through the 2-way mirror. We're not sure which customers were welcomed and which weren't, but women didn't go into the club for the first few years. Besides being known for his outstanding steaks, Click was also known for his colorful language. He served hamburgers and fries for lunch, but if a customer ordered that for dinner, Click could be heard bellowing from the kitchen "Who ordered the @!#?@! fries? They can go across the street to the @!#?@! Tastee Freeze for that!"